In college, I took a class on the literature of the Beats. Reading works by Jack Kerouac, Allen Ginsberg, Neal Cassady, William S. Burroughs, and Lawrence Ferlinghetti both incited within me all the requisite yearning for hipster freedom and smacked me up against the brick wall of misogyny and male privilege that such freedoms required. 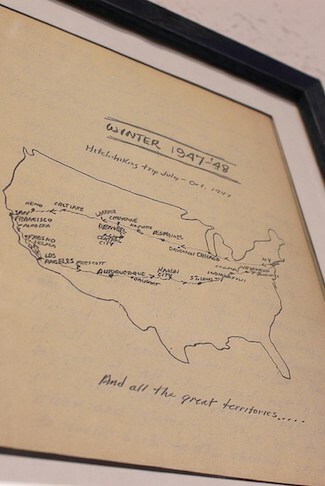 What appealed to me most about On the Road (which turned out to be one of my least favorite of Kerouac’s works) was the survivalist mentality that was required to traverse the country. As a kid, I was a huge fan of books like Little House in the Big Woods and Hatchet because they had descriptions of how to live off the land and prepare food. Somehow, Sal Paradise and Dean Moriarty’s hungry trek through the diners, backrooms, and highway shoulders of America struck a similar survivalist chord as those books of my early childhood. And for me, it’s plain old franks and beans that loomed the largest. “The girls, Babe and Betty, cooked up a snack of beans and franks.” (Part 1, Ch. 9) “We had a farewell meal of franks and beans in a Seventh Avenue Riker’s, and then Dean got on the bus that said Chicago and roared off into the night.” (Part 1, Ch. 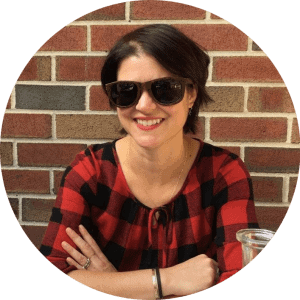 1) That semester, I found myself obsessively eating a meal I hadn’t had since preschool, pretending I was digging the stuff out of a can that I’d heated over a fire. It was my last year of college and I had no idea what I would be doing six months later, or where in the world I would be. Those franks and beans were a message sent out to a future self—a self who might be speeding through Los Angeles or camping in Montana, slugging to-go coffee in New York or wandering down a highway in Louisiana. A message that said, wherever you are, whoever you are, you can eat this and imagine striking out on the road. Now, ten years later and nowhere I imagined I might be, I’ve only had franks and beans once or twice since that semester. When I made them yesterday, though, while paging through my copy of On the Road from college, I was struck by how particular they smell: the smokiness of the beans and that bite of a hot dog hitting heat. I make my baked beans almost like a chili. While the pot is simmering, I cook the franks in a pan, cut them up and add them to the beans. In this way, I can almost imagine I just opened a tin and am warming my food in the fire, drying out my boots for another day’s journey. Note: if you want to make this vegetarian or vegan, just omit the bacon and use olive oil to cook your onions; then serve with vegetarian or vegan hot dogs. Place the bacon in a deep pan or skillet over medium-high heat and cook until crispy, then set aside. Sauté the onion in the bacon fat until browned. Reduce the heat to medium. Add the beans, coffee, cocoa, syrup, bourbon, and chili powder to the pan. Crumble the bacon into the pan and stir to combine. Cover the pan and bring to a simmer, then uncover and cook for 5-7 minutes, stirring occasionally, until thick and saucy. Add salt and pepper to taste. 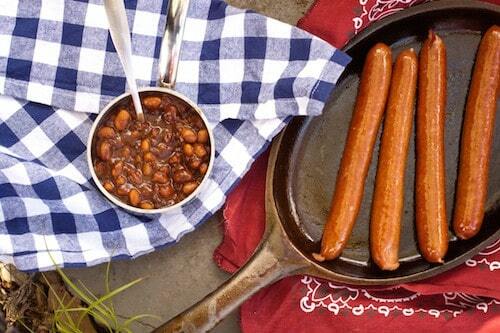 Bring a small, dry pan (or a grill pan, if you prefer) to medium-high heat and add the hot dogs. Every minute or two, rotate the hot dogs to get color on all sides. When they’re almost done, hit the pan with a glug of olive oil to get the hot dogs crispy all over. Cut the hot dogs into bite-sized slices, add to the beans, and enjoy.